Our school is situated on 13 hectares, roughly five of which are occupied by the school itself. The Trillium Lakelands District School Board initially planned to build a high school on the remaining eight hectares, but when circumstances and plans changed, these lands were put to good use: hands-on education. Our Ecosystem 2000 project was born in 1994. Our target date for positively affecting the local ecosystem was five or six years; therefore, the name was a great fit. The project’s main goal is to create habitat and food for a variety of species. 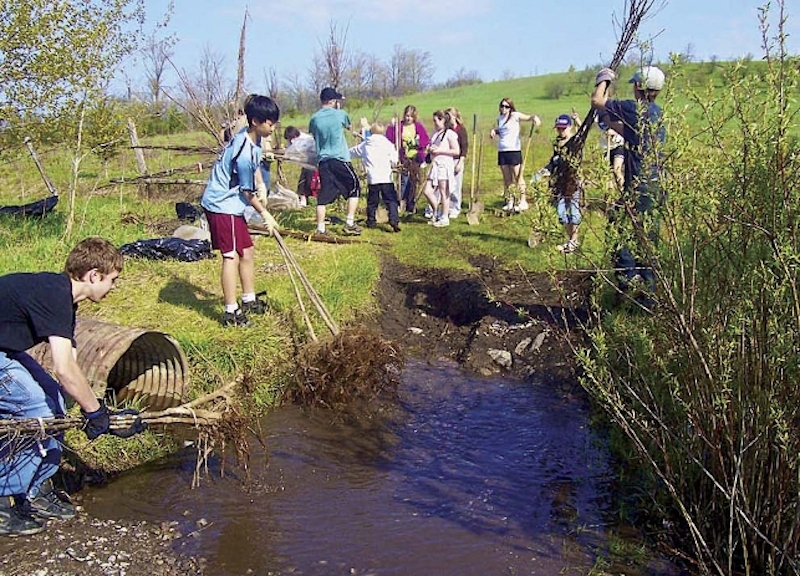 As the largest school tree-planting project in Canada, Ecosystem 2000 is extensive and complex. However, students see it more simply: they are working outside not inside, and they are improving the environment, not just studying it. The last ice age left a large three-hectare drumlin (an elongated whale-shaped hill formed by glacial action) that rests on the trail in our site’s northern section. Students and the community use this area throughout the year for dirt biking, four-wheeling, hiking, relaxing, and tobogganing and sledding. The view from the top is spectacular. The Pigeon River weaves through the rolling hills and valleys into the village’s small lake, to meet up beyond the horizon with the Trent-Severn Waterway. The site’s educational benefits are enormous. It is used by art classes studying Group of Seven painters; science classes looking for insects; hands-on topography lessons; cross-country and track and field training. But the favourite activity for students is building three-metre-high quinzies (snow shelters) in –20°C weather during three days of outdoor classroom learning. Just beside our school, a neighbouring farmer ploughed under 0.2 hectares of grass in the spring of 1995. That fall Intermediate students planted 1,500 seedlings (a variety of species, from the Ministry of Natural Resources Orono Nursery). Today, these trees are five to six metres tall. Over the years, my homeroom students have thinned out this area, transplanted hundreds of trees, and trimmed branches so it is easier to walk underneath. This is our shady reading area, a priceless and relaxing environment, especially appreciated when the tree canopy provides full shade from the summer heat and sun. We have come full circle with this project, as two of the original students involved are now teachers in our school system. They assisted with planting this area as grade 8 students and later were my teaching partners in grade 7 at SYPS. We have asked our pupils to become stewards of the land. This project is student-based: they get down and dirty. Each of our 240 students was involved with this season’s planting; grade 7 and 8 students were teamed with those in the Junior grades. They are walking the talk: thinking globally and acting locally. transplanted and thinned developing trees. My goals for Ecosystem 2000 in 2008 are the same as they were in 1994: enhancing an existing ecosystem and restoring the aging and declining rural treelines. Over the past 14 years, students have extended the existing treeline a further 20 to 60 metres, creating an enlarged corridor for animals and birds. Students have developed a better understanding of land-use issues and environmental concerns, and are better prepared to become stewards of their lands and communities. Planting the seeds of knowledge, skill, and empathy within the youth of today is key to future environmental protection . Funding is an essential component of our project: we have experienced four large-scale planting years and 10 years in which only my homeroom classes planted trees and seedlings, 100 each year. Funding has now topped $30,000, and we have secured another $30,000 over the next three years from several private and government agencies. This spring students will be involved in the largest and most complex activity to date: planting 1,000 large sugar and red maple trees and 1,000 seedlings of a variety of species; erecting osprey nests on land and in the water; creating a butterfly garden; planting three species of milkweed; and enhancing our shady reading area. From the very beginning, our project has been fortunate to have acquired friends, advisors, and financial backers who have been crucial to its success: Ken Reid Conservation Area, Ministry of Natural Resources, Lindsay and Peterborough offices of the Community Wildlife Improvement Plan, Rockwood Forest Nursery, Pine Needles Nursery, Maple Leaves Forever, Toyota/Evergreen Foundation, TD Bank Friends of the Environment Foundation, Tree Plan Canada, Ottawa’s Citizenship and Environmental Fund, Shell Environmental Fund, ETFO provincial office and, most importantly, the Canadian Wildlife Federation. The CWF has been involved from the very beginning, and many of my ideas were lifted or piggy-backed from their publications or from Green Teacher magazine. Last June, the CWF awarded us lifetime funding; as a full partner in our project the CWF will do the paperwork and teachers can focus on student learning. The students’ hard work, enthusiasm and environmental ethic have been recognized and rewarded with three National Wildlife Week Awards, as well as a YTV Environmental Award nomination and a Queen’s Jubilee Medal. Earth Month: If Not Now Then When? Don’t let another Earth Month pass without critically reflecting on the contribution you can make to our planet.